Unless New Zealand Cricket fashions a clear plan to help junior players move through the stages seamlessly, the team will be plagued with underachievement, according to Warren Lees, former national wicketkeeper and coach. 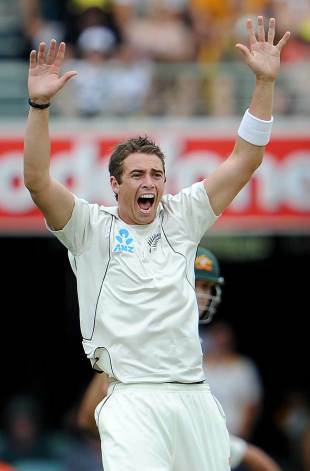 Lees used Tim Southee, who was axed for the second Test, as a prime example of the increasing gap between rookie and veteran and how it will affect the country's cricketing future. "I believe in having three groups as a cricket team. Everyone should start as an apprentice and then work their way into middle management and then become administration," Lees told ESPNcricinfo during the first Test in Dunedin. "What's wrong with the New Zealand team is that Tim Southee is in administration. He should be an apprentice. But, circumstances forced that on the team. Tim Southee isn't the only one but he is an example and a glaring one. He should still be sitting in the corner with his hands in his lap and listening. Then, it should take five tours and two years before he moves up." Southee was dropped from the New Zealand squad after a string of poor performances against South Africa. He has gone two matches wicket-less. He has also been expensive, lost his lines and with that, his self-belief. "Tim didn't have the game of his life," Ross Taylor, the New Zealand captain, said after the match, the first hint that Southee may be dropped. "He struggled a little bit with his action but he's played a few Tests now. He's a confidence player and hopefully he can bounce back from this." The ability to recover and continue to the next phase of international cricket is something that Lees feels will only be possible if players have the right management and team-mates who are in various stages around them. In the past, he does not think New Zealand had a structure with these distinctions. Lees referred to his own coaching stint, between 1990 and 1993, and highlighted it as being the period in which the gap between the newest players and their seniors widened. He blamed the divide to the inability of players at the mid-level to take youngsters under their wing and help them assimilate. "New Zealand did reasonably well performance wise when they had [Nathan] Astle,[Chris] Cairns and [Craig] McMillan, but none of them wanted to take the management roles," Lees said. "If you were a youngster getting into the team, none of those players offered anything. So there was this huge gap between Stephen Fleming and his seniors and the apprentices. We weren't developing a culture for the future so when they left the team had no direction." In recent months, New Zealand appear to have found a path and Lees hopes John Wright, the current coach who he played with, can keep them on it. He believes Wright will act as the bridge between players at different levels. "The one good thing about the team at the moment is that I can't see too many of them retiring anytime soon," Lees said. "Ok, Chris Martin has a limited life and Daniel Vettori is not going to be there forever, but he is not as effective as he was anyway. There's a stronger promise of what could happen in the future. And I think John Wright is the right sort of person to bring that out." With Wight's commitment, Lees said the New Zealand team will not want for dedication or a desire to produce their best. "They may lose through a lack of skill but they won't lose through a lack of effort," he said. "We saw a bit of that in this game. The first day taught some of those bowlers quite a lot and as a group they grew through the mistakes of day one. You could see for the rest of the Test there was more of a collective effort."